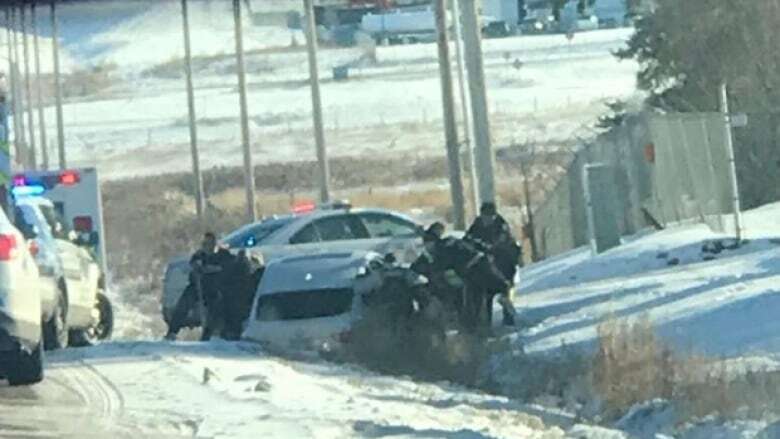 A court document has provided more details in a bizarre naked kidnapping case that happened last year south of Edmonton, but some questions remain. They thought it was Armageddon and wanted to save their neighbours. They believed police were monsters. They showed super strength after being pepper sprayed and Tasered. And all but one of them were naked because, with the end of the world, they didn't have time to get dressed. Two women and one man, who cannot be identified due to a publication ban, each pleaded guilty in Leduc provincial court last week to a charge of unlawful confinement. One of the women also pleaded guilty to dangerous driving. Her two teenage daughters were involved in the case, but not charged. The girls' father, who was not part of the group, has said the five may have unknowingly consumed some hallucinogenic tea. But the agreed statement of facts submitted in court says alcohol and drugs were not factors and there is no mention of tea in the document. The group, who are Jehovah's Witnesses, had gathered at a home near Leduc on Nov. 2. The mother, who was then 35, had taken her daughters there to visit her 27-year old nephew and his 30-year old wife. But over the next three days, the court document says, they didn't leave the house and they barely ate. One of the teens recalls watching movies but also hearing screaming and banging and seeing ashes in the air. Some of the five hid in a bedroom or a bathroom. "They did so because they believed that they were in danger, either from bad or wicked people outside or from demons," says the document. So they rushed off to find safety and save a neighbouring family. "Four who were naked were changing but they had to leave right away because it was unsafe, so they left without clothes," the document says. The mother, the only one dressed, drove them all in a BMW SUV but was in such a hurry she went through the garage door. When the vehicle headed to the neighbours' home, it apparently bent a metal gate. The neighbours — a man, his adult daughter and her six-week-old son — were forced out of their house and into the snow without shoes, the document says. The woman and her baby were put in the back seat with the teen girls, who were naked under a blanket. The man was put in the trunk and ordered to chant "Jehovah" 10 times. The group also chanted "Jehovah" as the SUV sped down roads and went through a red light on the way to nearby Nisku, says the document. Because the trunk didn't latch shut, the man was able to climb out when the vehicle slowed. His daughter, after getting her hand slammed in the door of the SUV, was able to get out with her baby. A passing truck stopped to help the trio and they climbed inside. The document says the SUV then rammed the truck from behind and the woman and her baby were thrown into the truck's dash, although they were not injured. The SUV then went into a ditch. When Mounties arrived, the group continued to chant and refused to get out, at times clinging to the vehicle and each other. One of the teens believed the police "were monsters who would kill them," says the document. were also shot with Tasers between two and four times before they relented, although one then slid under the vehicle and had to be dragged out with a strap. The neighbours later told police the group seemed "demonized" and "obviously not in their right minds." A judge has ordered pre-sentence reports and risk assessments, which could include psychological testing. The three adult offenders are to return to court for sentencing Dec. 20.